When you reach out to a bail bondsman in Rocky Mount, there are a few things you should expect. After all, you are relying on the bail bond company you choose for something extremely important — your freedom. You don’t want to work with an unreliable company that leaves you sitting in jail wondering what they are doing. Here in the United States, we operate on the premise that you are innocent until proven guilty. For this reason, you have the right to wait for you trial from the comfort of your home. Unfortunately, our justice system often sets bail amounts at such a high rate that the average person cannot afford the cost. This is where a bail bondsman should come into play and help you get out. The goal of a bail bond company is to provide you with an effective and affordable method for posting bail. Check out these five ways that your bail bond company should be helping you out. First and foremost, your bail bond team should be bringing expertise to the table. They should have a deep and intricate knowledge of how the local jail system works. This is why it is important to pick a company that has a good reputation in the community and has been working with the justice system for some time. Experience will make the process go a lot smoother for you. It will also mean that you don’t have to carry the stress of the situation. Your bail bond company will handle every detail for you, leaving you to focus on what is important — returning to your life and working on building a defense for your trial. Your bail bond company should also offer financing options. Even if you are struggling to meet the payment requirements for a bail bond, a bondsman should assist you. Usually, you will be required to pay a percentage of your bail amount. This is generally set around 10 percent. However, in the case that you cannot afford this, your bail bond team should offer you another method for financing your bail. Whether this is through the use of collateral or a cosigner, there should be alternative methods for paying for bail. Another important service that your bail bonds team should provide you with is constant communication. The last thing you want is to be left in the dark when you are waiting to be let out of jail. From the moment you call a bail bondsman or your family does on your behalf, they should be updating you with what is transpiring. Whether they need information from you or they have an update on when you will be released, they should ensure you are kept in the loop. Processing bail is not always simple. In some cases, obstacles will get in the way. Whether you are missing an important piece of information that your bail bondsman needs or you are struggling with money issues, your bail bond team should strive to overcome any obstacle in the way. A good bail company will be creative and resourceful. They will never give up and simply leave you stranded. A bail company should never be unavailable. Arrests can happen at any time of the night or day. They can happen on holidays and on weekends. For this reason, your bail team should be on call 24/7. You need to be able to reach a bondsman quickly. The sooner you contact a bondsman the faster you can get out of jail. 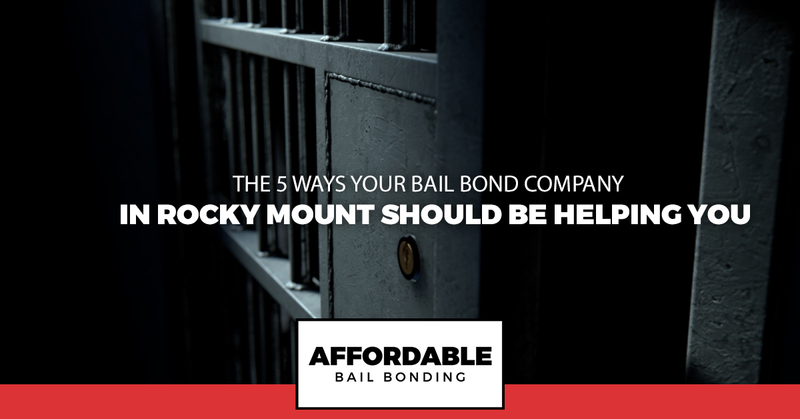 If you are looking for a bail bondsman in Rocky Mount who provides these five essential services, we are the team to call. We are here for you, night or day, ready to assist you in posting bail. We offer affordable bail bond options, including financing. We have a proven track record in our local community and are trusted for our expertise. We know how to navigate the local Rocky Mount jail system and we will work hard to get you out of jail quickly. Contact us right away for help.